The great CenturyLink outage of late 2018 is under way. At the time of this writing, we're 16.5 hours in, and I'm tired of using my Android phone as a Wi-Fi hotspot. I want my network back up. Fortunately, I have some tools to work with. I have a spare Android phone complete with an unlimited data plan (T-mobile ran a 3rd line for free promo a couple years ago) and a spare Raspberry Pi (seriously who doesn't have several of those kicking around). The idea here is that we can use the Raspberry Pi to turn that USB cell phone tether into ethernet, so our router can treat it basically like a modem. 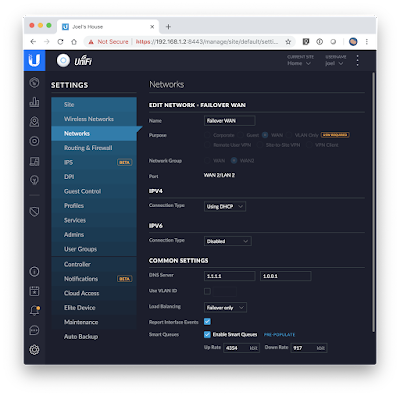 Now in my setup, I have a "WAN2" port on my Ubiquiti UniFi Secure Gateway. If WAN1 goes down, the USG will automatically flop over to WAN2. You might have do to "manual failover" when your ISP goes down, but shoot, even my CenturyLink DSL modem has a configurable WAN2 port, so it all depends on your setup. So let's get to work, and get some packets flowing on our network again. Disclaimer: Infosec is a huge blind spot of mine. I'm nowhere close to competent with Linux. Exposing a Pi to the internet is scary to me. Proceed with caution. 11. If you've already set up your router/gateway, then expect to wait a couple of minutes for things to start working. I don't know why. If you haven't set up your router than read on. After a few moments, all of your traffic should go through the Raspberry Pi. Keep in mind that if you need to reboot the Raspberry Pi for some reason, these settings won't stick. I think you could write a simple script to run those commands every time the Pi boots up. That's it!